Written by Colin Nederkoorn on December 30, 2013 . Revenue for 2013 was just over $300,000. December 2013 revenue was $50,000, up from $2,407 in December 2012. We’re ending the year with 330 active subscribers, up from 50 at the end of December 2012. Our team is now 5 people, up from 3 in December 2012. Our customers sent 40 million emails through Customer.io in December 2013, up from 582k emails in December 2012. Increased average revenue per customer to $150 per month, up from $48 per month in December 2012. We took additional angel investment in January 2013 and used that to fund operations through the year. We’re now looking to be cash flow positive in early 2014 with cash reserves of $200,000. We won’t be pursuing additional rounds of investment. Our plan is to grow the business on revenue. We have every indication that we can do that. Increase revenue 5x in 2014 to $250,000 monthly recurring revenue. Release V3 of the Customer.io app in Q1 2014. We’ve been replacing pieces of the infrastructure to support that effort and have been building a new UI over the past several months. Triple team size to 15 people. Key hires we’re looking for in Q1 / Q2 2014 are Devops Engineer, Marketing Manager, Infrastructure Engineer. Experiment with new pricing strategies (like pricing for active users only) to better serve different types of companies. Over the past few months we’ve been experimenting with a remote team. We’ve grown in confidence of that strategy and we’re now committed to growing remotely. We hired our first full time remote employee to start January 1st, 2014. Diana is based in Vancouver, WA. John (CTO and co-founder) will be a digital nomad for 2014. Over the past few months we’ve put the systems in place so we can be productive as a team no matter where everyone is. We’ll plan to have a home base where our distributed team can all gather — inspired by the 37signals office in Chicago. Looking at commercial real estate prices, New York is an expensive place to build that home base. We’re looking at alternative cities to relocate the company HQ. Scaling continues to be a challenge. We now have companies with well over > 1mm people in the system. We have to process all of the associated data for those people. As a result, we’re replacing pieces of the infrastructure to increase performance and capacity. It’s time consuming work and slow going. The more data you have the slower it is to test and make changes. John has done a great job learning this on the fly. We’re also looking to hire someone with a lot more experience to take over from him. Growth is at ~10% per month. While we’re building the new app, we haven’t been fixing bugs on the old app and this has been a struggle. We’re thrilled with what the new app will allow us to deliver to customers, but it’s slow going since we’re investing in writing good code instead of hacking things together. Struggled to keep up writing good content once a week. We experimented with some freelancers, but in the end decided that the quality we wanted meant we would need to bring the position in-house. That’s the Marketing Manager role we’re looking to hire for. On this day last year, John and I had switched our salaries to minimum wage and were working on a contracting project to get cash in to the company. All this just to make sure we could pay the bills in January. 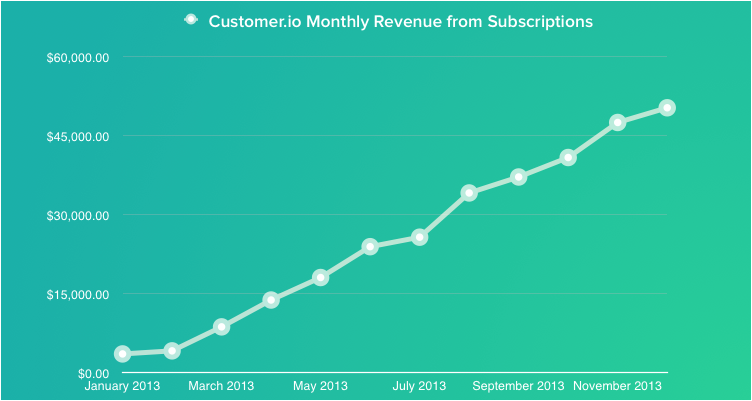 We knew that 2013 was going to be a strong year for Customer.io. Our guts told us we were on to something. We didn’t give up at the end of 2012 and I’m over the moon with what the team has accomplished in 2013. We’re looking forward to a great year in 2014. Thanks so much for your support and encouragement. P.S. Thanks to Joel Gascoigne from Buffer among others for showing me the courage to be transparent, both inside and outside the company.